Fees associated with filing patent applications in Morocco as well as other patent fees are available in the fee calculator. The term for filing a patent application in Morocco claiming conventional priority is 12 months from the priority date. The restoration of this term is not possible. To obtain the date of filing the patent application in Morocco must contain at least request to grant a patent, mentioning the title of the invention, and the proof of payment of the filing fees. The official language of patent registration in Morocco is French. It is possible to file an application in any other language. The translation should be filed within three months. Priority document translated into French must be submitted to the Patent Office within three months from the date of filing the patent application in Morocco. Simply signed Power of Attorney must be filed within two months from filing the Moroccan patent application. Substantive examination should be requested simultaneously with filing the Moroccan patent application. 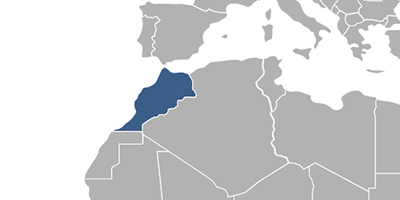 The novelty grace period is stipulated for patent applications in Morocco. It constitutes 12 months before the filing date. The fees for the patent maintenance shall be paid in the years following the year in which the patent was issued. The first annuity is included in the filing fee. Natural persons or legal entities who/which do not have their domicile or head office in Morocco must elect an agent, a registered patent attorney in Morocco to perform the patent protection on his/their behalf. 1. Online Search databases: Moroccan Regional Patents, European Patents (EPO). 2. As of March 1, 2015, it is possible to validate European patents in Morocco. 3. Protection of the invention as utility model is not possible in Morocco.